Coccidiosis is the name given to a group of closely related diseases caused by a protozoan parasite called Eimeria. The Eimeria develop inside cells lining the intestine. As the parasites reproduce they cause bleeding and massive swelling of the gut. This leads to a huge loss of liquid and the bird is unable to absorb the nutrients from its food. If you are thinking that this sounds a lot like Avian Gastric Yeast, you are right. They are similar and tend to go hand in hand. There are 4 basic stages to the protozoan. The Sporozoite stage is the infective/active stage. The sporozite contains special proteins and enzymes that allow it to penetrate the cell wall. Once nestled inside the cell the sporozite begins its development through the various stages. More parasites are produced during these stages, they in turn move on and in to healthy cells to begun the cycle again. The result is weakened cell walls that allow moisture to leak and damaged blood vessels. This loss of blood and fluid is often fatal to the bird. Coccidiosis is passed to another bird during the Oocyst stage. The Oocyst is an egg-like structure that is excreted by the bird in to the environment/cage. The oocyst can remain inactive and exposed for many weeks and still infect another bird. The infection starts when an oocyst is ingested. Once ingested you may notice symptoms of the infection as early as 4-6 days later. 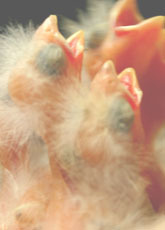 Coccidiosis occurs naturally and is quite prevalent in wild bird and domestic bird populations. 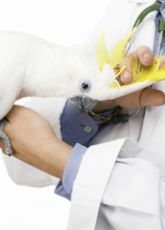 Many birds that are exposed to a small number of the protozoa do develop a natural immunity to them. The problem with infection occurs most often when birds are housed in large concentrated groups. This allows the protozoa to grow in number and become more deadly. When is an outbreak most likely to occur? During the wet season or during any time of year of the area is damp. 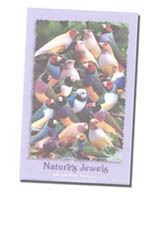 Keeping birds in tight groups (over crowding) will also promote the spread of the infection. Listlessness, lethargy, weight loss, blood in the droppings or elsewhere in the body, diarrhea, and dehydration are all common signs of Coccidiosis. The birds may also appear to have dirty or wet vents. A high chick mortality rate during the breeding season can also be a sign you may have a Coccidiosis infection in your aviary. Birds that are infected with Coccidiosis may not show symptoms until they are under stress as this allows the infection to grow. 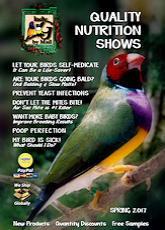 Also note that birds passing the oocysts may not themselves show any symptoms of the illness. I recommend treatment with Endocox 2.5% Powder. Mix 5g to 1gal of drinking water and remove all other sources of water from the cage/aviary. Treat for 5-7 and retreat as required to rid your flock of the protozoa. Why can�t I treat with Ronex? Ronex will treat most protozoal infections but not the coccidial protozoa that cause Coccidiosis. Ronex is simply not effective against this organism. Endocox 2.5% Powder- highly effective against Coccidiosis in cage birds.